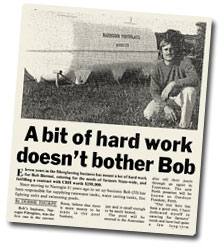 The Freedom Tanks story started in 1973 when current owner, Bob Biernat, established Narrogin Fibreglass to design and manufacture water tanks and swimming pools. Word of the company’s reliability and quality products soon spread far and wide and it wasn’t long before Bob was supplying tanks to farmers in Perth and then on to the eastern states. Today, Freedom Tanks is one of the largest suppliers of cartage tanks in Australia. Thousands of tanks are still out there working and performing– in our tough country.